My dad and I ordered up some fat 50 cans to split up. We ordered 12 and I was going to keep 3 and he was going to keep 3 as well. The rest we were going to sell to some guys at work. I decided to ask my wife if she wanted any of them to store her odds and ends. At first she didn't seem interested but I brought up one of my 50 cal cans and showed her how much bigger these would be. She decided she wanted 5 of them for herself. I was kinda surprised. Happy to have extra ammo cans in the house however. I just thought it was interesting she would find a use for them. I have a bunch of 30 and 50 cans. These are the first fat 50 cans I've ordered. They're expected to arrive later this week. Anyone else remember the good, old days when CTD sold a six pack of .30 cans for $20? The start of my ammo fort. That is so odd that two of us would both like tater tots? WHAT ARE THE ODDS??! When you want to feel rich, count your blessings. And where are the damn pics? I'm just teasing! I've actually been on the lookout for more new / like new ammo cans myself! I "like" tater tots, but I "love" my scooby doo lunchbox! I'll post up some pics when I get them. I ordered some grade 2 cans from ammocanman. The pictures on their site don't look the best but I've been told it's a worst case scenario. I just ordered a bunch from Aimsurplus and they are cheaper than my local Bass Pro. Edit. They are also a site sponsor. Pics of wife and her cans or GTFO. Your wife has more ammo cans than you now? What surprises me the most is that she let you out of the kitchen long enough to post this thread. 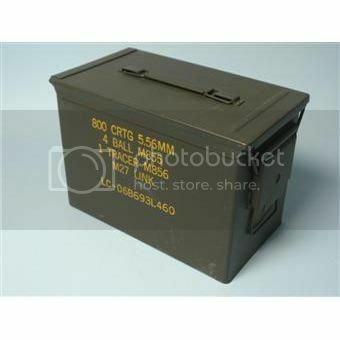 I'm trying to imagine any man I've ever dated caring what I thought about ammo cans. If your gonna post nice cans you should know better than to post just one! Everyone knows a nice PAIR of cans is always better! Here is a nice pair of JUGS for those of you that prefer Jugs over cans! Yea, that's right! That's right! We bad! Those are some fine cans! I drinking coffee in bed for my breakfast.